A new train station recently opened up in Calgary and they re-erected this old sign. When I first moved here I noticed the sign in front of a cool old gas station that looked like it belonged on the set of “Back to the Future”. I never got a picture of the building, because I never thought they would tear it down or move it. Anyhow, they did move the building (I believe), but I’m not sure where to. I am happy they fixed up the old sign and put it back up though, it’s brings a real charm to the Tuscany C-Train Station. 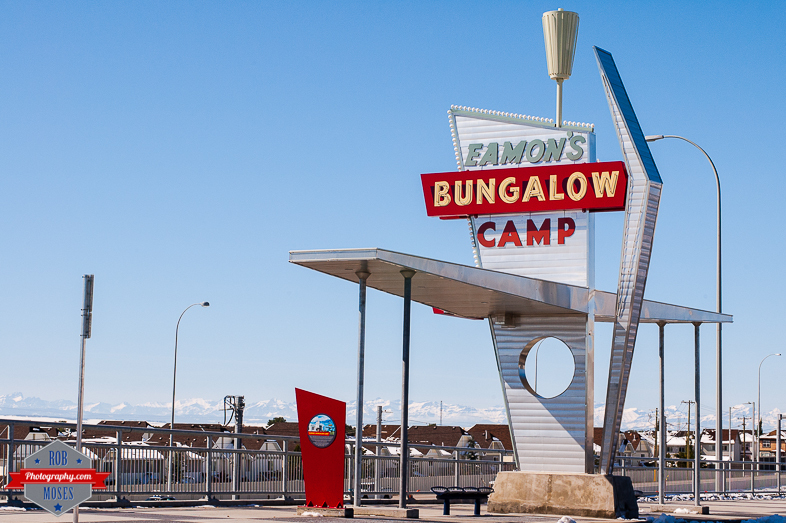 This entry was posted in Cities, Random, Uncategorized and tagged 50mm, 50mm 1.4, 50mm Ai, Alberta, awesome, beautiful, bus stop, C-train, Calgary, Canada, City Life, cool, D70, Eamon's, Eamon's Bungalow Camp, manual focus, mountains, Nikkor, Nikon, Nikon D70, old camera, old lens, photo, Photography, pretty, prime, rockies, rocky mountains, Sign, sky, train station, Tuscany, vintage, yyc. Bookmark the permalink. ← Winter or Summer ? wow–talk about retro! This is wonderful. Good one, Rob. Oh cool, thank you for sharing that. The garage was moved to Stavley Alberta where it sat in an enclosed quansit for a number of years. The River City Classics bought the garage from the city of Calgary for $10.00. The building has since been relocated to High River and is being restored and turned into a museum. Please go the River City Classics Car Club website for more info and pics or Friends of Eamons Garage.